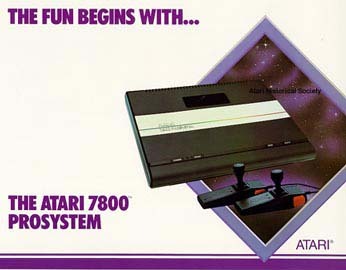 The Atari 7800 Pro System plays both 7800 and 2600 games & controllers. We have a complete line of 7800 Systems and games. For additional games & controllers to use with this system, see our Atari 2600 pages our this site. Complete Atari 7800 Pro System includes a 7800 Pro System Console (Tested) , TV / Game Switch , Video Cable , Power Supply , 2 Pro Line Joysticks & a Pole Position II game cartridge. For Atari 2600 games and controllers, click the button below.